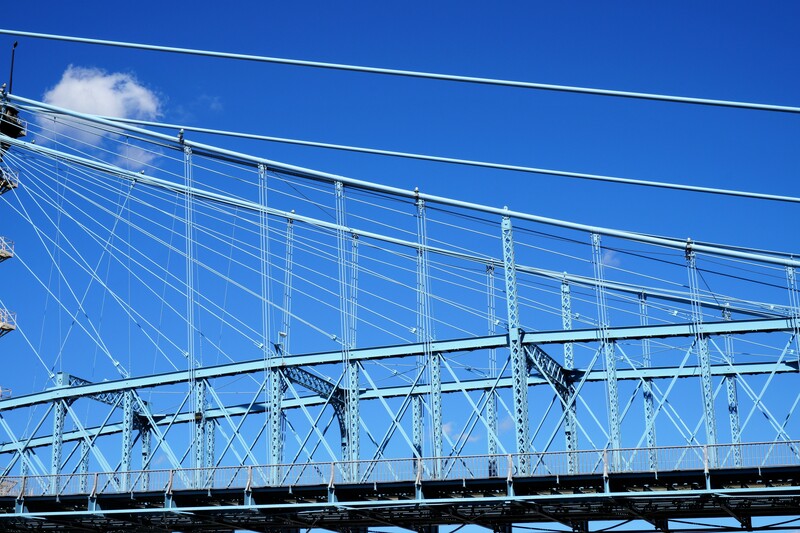 Situated at the confluence of the Licking and Ohio Rivers, this historic neighborhood was the first area to be settled in Covington. The lovely homes, tall shade trees and fantastic river views are complemented by several bronze statues on Riverside Drive. Take a stroll down these quiet streets and discover for yourself the charm of this neighborhood. Public Art The Riverside Drive statues, in particular, add history and artistry to a walk along the river. Listen to cov200tour.com’s audio tour of these statues here. 26. 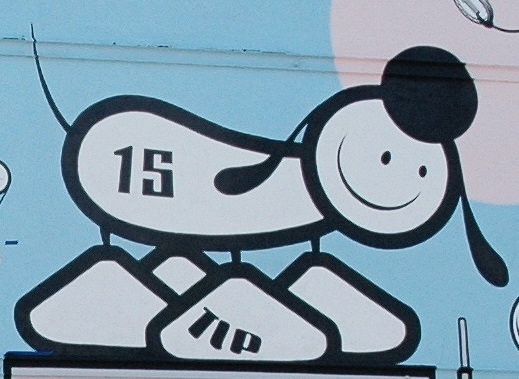 Boone Block Mural (Scott St. & 4th St.) Begun in 2013 with a single cartoon dog (called a Lad), the artists, who call themselves The London Police, returned in 2016 to finish this mural. The green section at the bottom is the site for a planned “living wall”. 27. Captain Mary B. Greene (George Rogers Clark Park, Riverside Dr.) Captain Greene was one of the few women of her day to become a licensed pilot and boat master. 28. Chief Little Turtle (Riverside Dr. & Shelby St.) Chief of the Miami people, he was known as a great military leader, who united the Miami, Delaware and Shawnee to fight together. 29. 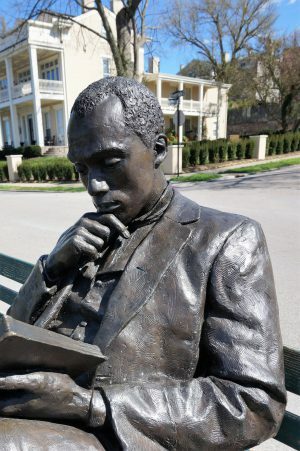 James Bradley (Riverside Dr. & Kennedy St.) Depicted thoughtfully reading a book on a bench by the river, James Bradley was once a slave. 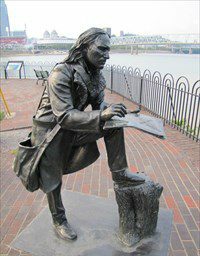 He earned enough money to buy his freedom and subsequently enrolled in a Cincinnati seminary. 30. John James Audubon (Riverside Dr. & Shelby St.) Audubon was a naturalist, ornithologist and painter. He was known for his extensive studies documenting various breeds of North American birds. He spent some time in this region during his career. 31. 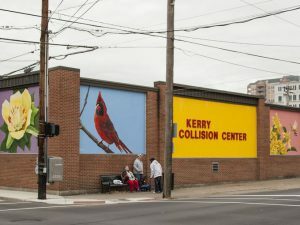 Kentucky Natural History Murals (24 E. 5th St. & Scott St.) Painted on the side of Kerry Automotive, these murals depict images of Kentucky’s wildlife and natural history, including many Kentucky State symbols. 32. Lincoln Statue (502 Scott St.) Artist Matt Langford created this statue of Abraham Lincoln, which stands next to the public library. 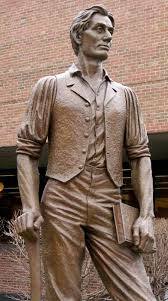 Langford depicted Lincoln as a young man with an axe (a symbol of his work) and a book (a symbol of his aspirations). 8. John A. Roebling Suspension Bridge (Riverside Dr.) Designed by John A. Roebling and completed in 1866 at a total cost of $1.8 million, Roebling’s bridge served as the model for his next project: the Brooklyn Bridge. The president of the Bridge Company at the time of completion was Arnold Shinkle, whose carriage house is on this tour. Read more about his history of this beautiful structure here. 5. George Rogers Clark Park (Riverside Dr.) During the Revolutionary War, Lt. Col. Clark protected Kentucky from the British and Native Americans. Although originally from Virginia, he settled in Kentucky and spent the last years of his life here. 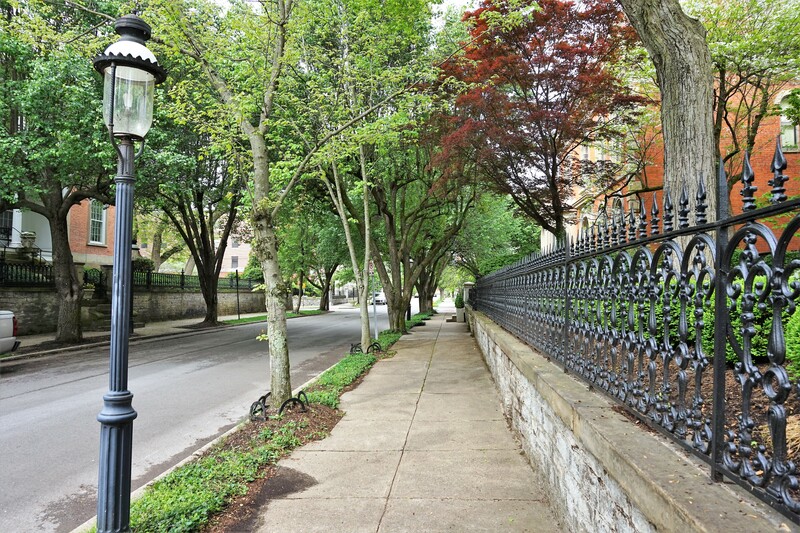 This charming park has a dense tree canopy and stellar views of the Ohio River. Restaurants Click on the name of each for more details.